Kubla Khan is a poem written by Coleridge. It is a controversial poem. However, the shortcut is found in the Biographia Literaria in which the critic Coleridge reestablished a concept of poetry. In it, he made emphasis on "a semblance of truth" that is a resemblance of reality. Therefore, he is supposed, as he mentioned in his Biographia Literaria, to make a resemblance of truth which provides or procures the shadows of imagination, the willing suspension of disbelief for the moment of reading the poem which constitutes the poetic faith. In the poem, we are supposed to find objects or subjects which look like reality; however, taking in consideration that the world of the poem differs from that of reality. There is difference between Coleridge and Wordsworth in this issue, for Coleridge criticizes Wordsworth for having too much matter of factness in his poetry. Almost, reality is found in the poetry of Wordsworth, where as Coleridge believes that there must be a resemblance only in the matter of the chosen topics for poetry. Moreover, Coleridge believes that informative poetry such as that of Wordsworth, is a product of fancy. He divides the imagination into two parts: secondary and primary. The primary imagination is that power in man which perceives and recognizes objects; the secondary imagination acts on these initial perceptions to produce new thoughts:"It dissolves, diffuses, disciples in order to recreate". In addition, Coleridge regards poetry as a product of the secondary imagination which only differs form the primary in degree. Therefore, according to Coleridge, Wordsworth's poetry is rather a descriptive one since the distance between the world of reality and the world of poetry is small. 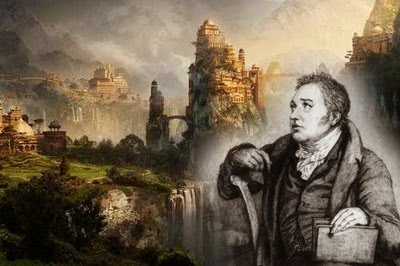 Coleridge has once said that the poem "Kubla Khan" is a product of a dream. Many critics also consider it as a product of a dream since Coleridge used to be an opium addict. They believe that he used to go to sleep, wakes up having the lines in his head. However, this is not true. Yet, there exists some reasons for which these critics believe that it is a product of a dream. First, the poem is a fragmentary; there exists no coherence and unity in the lines of the poem. Second, their knowledge of his being an opium addict, and his own notes in which he says that the poem is a product of revere. Therefore, the suggestion that the poem is a product of a dream indicates that it is not a product of a conscious will or consciousness. In order to examine whether this is true or not, we have to analyze the lines of the poem closely. On one hand, we find that the poem has a factual reference in a book written some three hundred years before in 1160 named the "Pilgrimage" for Purchase. In this book, the reader would have to come across the following "ten miles from Xanado a dome of pleasure was built..." This is an indication that the poem has a factual reference outside the poem. Therefore, knowing that some of the details and pictures inside the poem have a factual reference is a reason for many critics to believe that it is not a product of a dream. However, this is not sufficient enough in order to say that it is not a product of a dream. Yet, the evidences or reasons for such a claim are not poetic and they don't exist outside the poem, but rather inside it. Thus, having a factual reference may still keep the possibility of being a product of a dream since the atmosphere, the critical one, tends to believe that it is a product of a dream. So, it is not easy to consider the poem as one part, and an effort must be exerted because there is no unity. Even thematically speaking, discontinuity exists, for there is no thematic progression. For example, considering the lines from the beginning of the poem:"Sunny pleasure dome with caves of ice..." we could find some thematic unity; however, after these lines, there is no continuity, so, if there is a theme, it is not a unified one. Moreover, we have after words-"A damsel with a dulcimer"- this has no thematic relation for what proceeded. Then, the poem doesn't grow through its theme. Another example is the line "A damsel with a dulcimer", "Could I revive within me". It appears that we have shifted into another thematic level. Therefore, thematically, there is no unity in the poem, yet, structurally speaking, the poem is one. There is a systematic rhyme scheme in the lines although the poem is not made up of stanzas and is easily observed through out the poem. It is obvious that the poem is not a product of a dream since there is coherence in the lines. Moreover, one reason for which the critics believe that this poem is a product of a dream might be the title itself in addition to Coleridge's own confession that it is a product of revere. However, the title doesn't form a clue that proves the poem to be a product of a dream because the poem is not about the title. For, although the title seems exotic, it was already mentioned before in purchase's book. Therefore, the title is a vibrant element in the poem used to add the supernatural aspect to the poem. Coming back to Coleridge's conception of poetry, he said that the subject matter could be the supernatural. Because the title is exotic, some critics found this a reason to believe that the poem is a product of a dream. However, it is not since it is a technical element that provides the poem with the supernatural element as well as to add the atmosphere of strangeness to the poem. On the other hand, there is a coherence in the poem, a solid coherence, for example, if we consider the lines "I would build that dome in air" we could notice that "That" is a definite article, grammatically speaking; therefore, the dome is a specific one which was mentioned and described many times before that through out the poem. It has been described as the dome of pleasure decreed by Kubla Khan. It has a form of half circle shape indicating fulfillment and satisfaction. Moreover, the statement "Could I revive within me" implies a needed answer which could be yes or no. Yet, these are many reasons for which we could consider the answers to be yes. Because he would not add another adjective for the dome if it weren't achieved at first "And all should see them there", this implies that the dome is accomplished and it does exist; therefore, the tendency of the poem is rather a positive one. In addition, "He on honey dew has fed", Paradise, the sunny dome, and the dome of pleasure are all positive achievements. Therefore, the tendency of the poem is a positive enhanced by the almost systematic scheme and the absence of the stanzaic form which indicates the non existence of interruptions. This tendency could not be achieved without the full intellectual efforts of the poets consciousness and not through a dream. The rhythm is rather quick indicating a forward movement. It is like a song in line 45 "That with music loud and long" for example. The scenery constructed inside the poem has no equivalence outside the poem. For, Coleridge is not objectifying a landscape. He is not imitating something or a reality outside the poem and he is not describing anything. Coleridge is creating his own nature. He is reconstructing an objective image. The existence of exotic names are no source for the suggestiveness as in themselves in the poem. They add an atmosphere of strangeness only. The Alph river is taken from Milton. The names are taken from different sources. The past tense indicated by the word "did" in part one means that things already done. The river is running to a sunless sea. The poem is not fragmentary. There is a thematic and semantic coherence. For, the river moves from the source to the sea. Coleridge, here, is abiding to the rules of nature which is a thematic coherence. He is creating a second nature that resembles the true realistic nature. For, the reference of the structure of poetry is the structure of reality. The poetic elements in poetry are the same, but what differs is the combination of these elements. The structure of the poem proves that it is not a dream for Coleridge once to build a paradise and we feel the existence of an acceleration from the start till the building of the paradise.